Another complication here is that the s and p orbitals do not start out at the same energy level. When the orbitals mix, one combination goes up in energy and one goes down. Does the s antibonding combination go higher in energy than the combinations from p orbitals? Do the p bonding combinations go lower in energy than the combinations from s orbitals? We will simplify and assume that the s and p levels remain completely separate from each other. This is not always true, but the situation varies depending on what atoms we are dealing with. We first need to define one axis as lying along the N-N bond. It does not really matter which one. We arbitrarily say the N-N bond lies along the z axis. The pz orbitals have a different spatial relationship to each other compared to the py and px. The pz orbitals lie along the bond axis, whereas the py and px are orthogonal to it. As with the s orbital, the pz orbitals can be in phase or out of phase. The in-phase combination results in constructive interference. (By "in-phase" here we mean the lobes that overlap are in-phase; for that to happen the two p orbitals are actually completely out of phase with each other mathematically, so that one orbital is the mirror image of the other.) This combination is at longer wavelength than the original orbital. It is a lower energy combination. The out-of-phase combination (meaning in this case that the overlapping lobes are out of phase) results in destructive interference. This combination is at shorter wavelength than the original orbital. It is a higher energy combination. As a result, we have two different combinations stemming from two different p orbitals coming together in two different ways. We get a low-energy, in-phase, bonding combination and a high-energy, out-of-phase, antibonding combination. What about those other p orbitals, the ones that do not lie along the bond axis? We'll take a look at that problem on the next page. 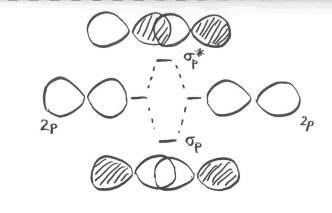 Draw an MO cartoon of a sigma bonding orbital formed by the overlap of two p orbitals between two oxygen atoms. Label the positions of the oxygen nuclei with the symbol "O". Label the O-O bond axis. o Draw the orbital from the base that is likely to donate its electrons. o Draw the orbital from the acid that is likely to accept electrons. 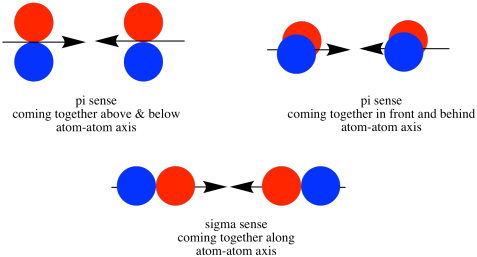 o Draw a cartoon showing the mixing of these orbitals.